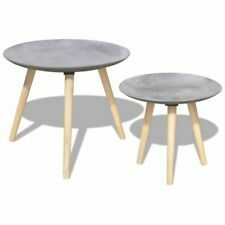 VidaXL Two Piece Side Table/Coffee Table Set 55 cm&44 cm Concrete Grey. You can place this side table set in the corner of any room or at the end of the corridor. These side tables can also be used as coffee tables. Made of: 100% solid oak (sanded). This lovely Small Solid Wood Coffee Table will make a practical as well as decorative addition to your interior. The coffee table is easy to assemble. Black wooden coffee table round big 2 levels . Condition is use but very good. Collection form e10 leyton. best offer. Indian handmade furniture with contemporary design and looks. Eco-friendly wood used. - No assembly. We accept all major credit & debit cards. - W 88 cm x D 88 cm x H 45 cm. Easy to assemble. You can place this side table set in the corner of any room or at the end of the corridor. These side tables can also be used as coffee tables. Can also be used as coffee tables. Colour: Concrete grey. And robust iron pin legs make the table stable and secure. ♢ String Lights. Relax with your family and friends around this unique and original coffee table! Garden & Patio. Storage Bag &Travel Bag. You can place this side table set in the corner of any room or at the end of the corridor. These side tables can also be used as coffee tables. Assembly is really easy. Garden & Patio. Easy to assemble. Pieces Included: 2 Coffee tables. This may not be suitable as a gift. Assembly Required: Yes. Southern Ireland (EIRE). Small Table. Scottish Highlands, Scottish Isles, Northern Ireland, Isle of Man and Isle of Wright. Colour Concrete grey. You can place this side table set in the corner of any room or at the end of the corridor. These side tables can also be used as coffee tables. Easy to assemble. Can also be used as coffee tables. Solid Oak Nightstand Bedside Lamp Light Table Unit Cabinet with1 Drawer Brown. vidaXL Two Piece Side Table/Coffee Table Set 55 cm&44 cm Concrete Grey. Colour: Concrete grey. You can place this side table set in the corner of any room or at the end of the corridor. COSTWAY Wooden Nesting Table with Round Shape, 2 Sizes of Small and Large, Wood Grain Surface, Premium MDF, Innoxious Varnish, Use as Sofa End Table| Corner Lamp Stand | Coffee Table (Round Large). STYLISH LOOK?Side end tables with clean lines and stylish design compatible well with any decor of your room, perfect combination with other furniture accessory. Material:Made from hard-wearing MDF top and solid beech wood legs. The sleek white top and feet of this round accent table make a nice contrast to the black wood legs. We apologize for any inconvenience this may cause. Garden & Patio. Colour: Concrete grey. You can place this side table set in the corner of any room or at the end of the corridor. These side tables can also be used as coffee tables. Can also be used as coffee tables. Garden & Patio. You can place this side table set in the corner of any room or at the end of the corridor. These side tables can also be used as coffee tables. 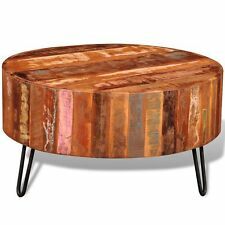 Can also be used as coffee tables. Colour: Concrete grey.